This essay is part of the the Antoni Paszkiewicz project. 2014 saw the 70th anniversary of the attack at Monte Cassino and the airborne attack at Arnhem, in both of which Polish troops played an important and memorable role. Less well known, the 1st Polish Independent Parachute Brigade Group had suffered a number of deaths and injuries prior to the attack at Arnhem in September 1944. Among Toni’s papers is a newspaper cutting that commemorates four of his fellow soldiers who died preparing for an—then unknown—airborne attack in occupied Europe. 2014 is also the 70th anniversary of their death. 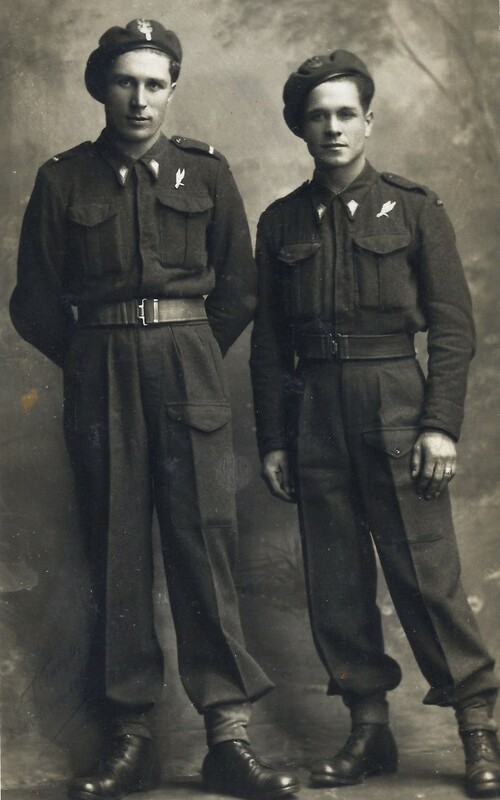 Toni had joined the Polish Parachute Brigade when he arrived in Scotland from Iraq in June 1943 and had been posted to the 1st Polish Parachute Infantry Battalion. He would not take part in the attack at Arnhem, however—he was badly injured in May 1944. 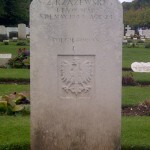 Parachute accidents were relatively uncommon and the Poles had suffered only a handful of deaths after the first fatal accident on 16 June 1941, when Podporucznik (Second Lieutenant) Jan Twardawa was killed at RAF Ringway, then the home of the Parachute Training Squadron of the Central Landing Establishment. But on 8 May 1944, when the Battalion was taking part in an exercise somewhere near Salisbury plain—the exact location is unknown—a serious accident occurred that resulted in the deaths of four men. It is believed that this was the exercise in which Toni was seriously injured also. He had lightened the load in his leg bag—the bag held the soldier’s field equipment and was lowered on a rope; it reduced the weight carried by the soldier on landing—and he had been blown away from the drop-zone. Toni landed badly in a ploughed field and suffered severe head injuries. He was in hospital for nearly a year and his injuries precluded further military service. Among Toni’s papers is a newspaper cutting that commemorates three men who died on 8 May and one who died the following day. The yellowing paper was obviously important to him. 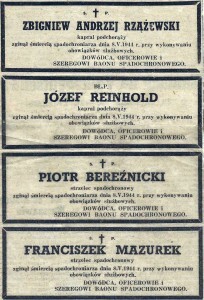 Those killed were: Kapral Podchorazy (Corporals (Officer Cadets)) Jozef Reinhold, age 22; and Zbigniew Andrzej Rzazewski, age 24; and Szeregowiec (Privates) Piotr Bereznicki, age 20 and Franciszek Mazurek, age 26. The four men were buried in Tidworth Military Cemetery. The newspaper commemorations recorded that the men ‘died the death of a parachutist on 8 May 1944 in the performance of official duties’. Each commemoration is signed: ‘commander, officers and men of the parachute battalion’. While Toni lay injured in hospital the 1st Battalion continued its training and learned of its role in Operation MARKET GARDEN. 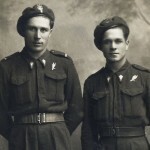 The Polish Parachute Brigade came under British command in June 1944 and was ordered to move from Fife in Scotland to the area around Stamford in England. 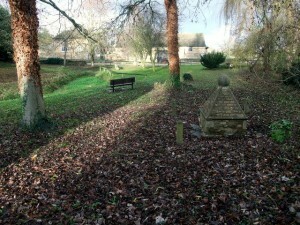 The 1st Battalion moved to the beautiful, limestone village of Easton-on-the-Hill on the edge of Northamptonshire. It was from here that it conducted its final preparations for the assault on ‘fortress Europe’. On 21 September elements of the 1st Battalion finally dropped at Driel, south of Arnhem—the remainder of the Battalion and the 3rd Battalion were not dropped due to the bad weather. 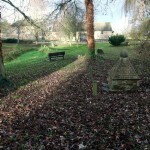 On the edge of Easton-on-the-Hill, amongst the trees in a small park, known locally as Spring Close, is a small, unremarkable, stone pyramid. It is the memorial to those other friends and colleagues of Toni Paszkiewicz in the 1st Polish Parachute Infantry Battalion who died during Operation MARKET GARDEN. I would like to hear from anyone who has more information about the accident on 8 May 1944. 1. (Back) The worst training accident to befall the Brigade occurred on 8 July 1944, when two C-47s of 309th Squadron, 315th Transport Carrier Group, United States 9th Air Force, touched wings shortly after takeoff from RAF Spanhoe. They were part of a parachute exercise involving 33 aircraft carrying 369 men of the 1st Polish First Independent Airborne Brigade, who were to drop at RAF Wittering. The two aircraft crashed close to the river Welland near Tinwell. Twenty-six Polish soldiers and eight United States Army Air Forces personnel were killed. There was only one survivor, United States Corporal Thomas W. Chambers was standing at the rear door of one of the aircraft and was forced out as the collision occurred. 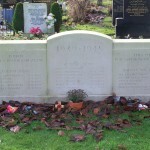 The Polish casualties are buried in Newark-upon-Trent Cemetery. 2. (Back) Podporucznik (Second Lieutenant) Jan Ernest Twardawa was undergoing training for operations in Poland. 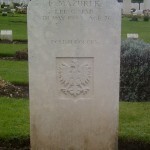 He is buried in the Second World War plot at Manchester Southern Cemetery and commemorated on the memorial to the 17 Polish casualties buried there. None are commemorated by individual headstones. 3. 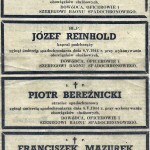 (Back) Bereznicki, Mazurek, and Rzazewski died on 8 May, and are recorded as serving with the 1st Battalion. 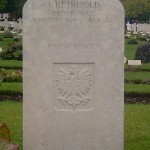 Reinhold died on 9 May and is recorded as serving with the 1st Polish Independent Parachute Brigade. The newspaper cutting, however, records all four men as having died on 8 May 1944. 4. 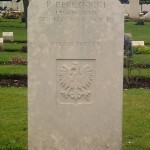 (Back) Section F, Polish Section, Graves 43 (Mazurek), 44 (Bereznicki), 49 (Rzazewski) & 50 (Reinhold). 5. (Back) Oosterbeek War Cemetery, Grave 34.A.9. This entry was posted in Antoni Paszkiewicz Project, Second World War on October 14, 2014 by Nick Metcalfe. Hi as a boy I remember seeing a war memorial by the river at Tinwell all covered in the trees and nobody seemed to know it was there. A tragic event. There is also a plaque listing the Polish paratroopers and United States Army Air Force crewmen by name in All Saints Church, Tinwell. Hi there. I spent all day yesterday looking for the stone memorial by the rivers edge. As I spent 12 years in 2 Para I thought I should find it. Seems either the bank has eroded and its gone or someone has destroyed it to stop people going across there land either way it didn’t stop this paratrooper searching.